Gardner held a press conference in D.C., taking the lead with other Republican lawmakers who are also angered by news report that Obama plans to circumvent Congress and current law to transfer the terrorists to U.S. soil through executive fiat. Meanwhile, White House spokesman Josh Earnest essentially confirmed that plan. “But as the president’s spokesman here, I’m certainly not going to take anything off the table in terms of him doing everything that he can to make progress on a national security priority that he has identified,” Earnest said. That’s exactly what we told you yesterday. The White House is working on options for executive action that would include legal justifications. The president’s actions have even pissed off U.S. Sen. John McCain, who actually wants a plan to close Gitmo. He called the president a liar, and his actions disgraceful. “He lies when he says that he really wants to close Guantanamo with the cooperation of Congress, because he’s never sent over a plan,” McCain said. Gardner said yesterday that Obama would violate the law by bringing Gitmo terrorists to the U.S., because taxpayer money cannot be used for the transfer. 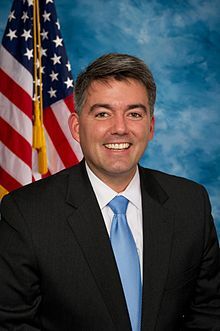 Gardner noted that Obama has already broken the law because taxpayer dollars were used to send a Pentagon team to Colorado to tour our prisons as a potential jail site. I will not sit idly by while the president uses political promises to imperil the people of Colorado by moving enemy combatants from Cuba, Guantanamo Bay, to my state of Colorado, Gardner said. We applaud Gardner for keeping up the heat on this issue, and doing in Washington what we elected him to do. Sadly, we can’t say the same for Sen. Michael “I was for the transfer before I was against it” Bennet. Our representatives have an obligation to stand up for the rule of law, and the president has an obligation to drop campaign promises that imperil the people of this country. 2. Give them a fair trial. They are not PoWs as Congress has not declared war. They are being held illegally.